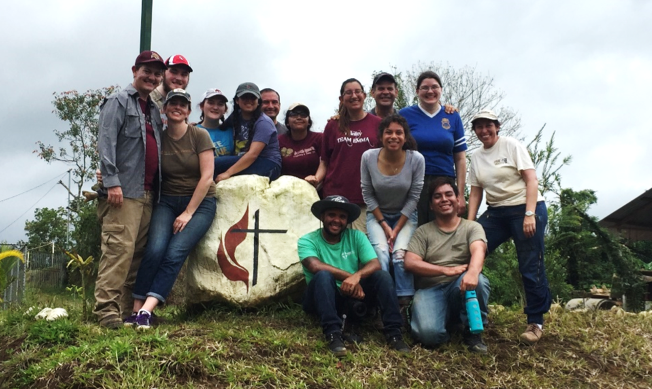 Fifteen college students and supporters from San Antonio Wesley and Texas State United Campus Ministry went on a mission trip to Costa Rica over Spring Break 2018. Students spent the week helping a local Costa Rica Methodist Church in Rio Cuarto as it prepared to expand its reach into the local community. The Rio Cuarto Methodist Church identified more than 300 nearby families that need quality childcare and early education. Pastor Douglas Mejías set a goal to open the first classroom of 50 students by Easter this year with a focus on children with special needs. In order to meet this goal, students helped prepare the church grounds to welcome children. Students added drainage, removed rocks, prepared the soil, and planted grass in the space between the sanctuary and a classroom building. Students painted sealant on the outside of church buildings, helped lay tile in the bathroom, put up drywall inside new classrooms, poured concrete for a gate, and helped clean up debris from on-going construction. Jerry Martinez from Wesley San Antonio appreciated the experience. Students worked through pouring rain and hot sun to complete many of the needed projects while developing relationships with local Costa Rican Methodists and each other. Students also made it a priority to worship, pray, and grow in faith. College students led a special VBS program for local children with songs, crafts, and a bible story. Hannah Lindsay from Texas State UCM honed her Spanish skills on the trip. Students participated in worship by leading a song during Wednesday worship with the Rio Cuarto congregations. College students led evening devotionals to reflect on how each person experienced the presence of God during the day. As the work continued, students took special time to take a prayer walk throughout the church grounds to pray for the people, buildings, and ministry. The Holy Spirit was visible through the service and witness of these faithful students. The group also took time to enjoy the beauty of God’s creation in Costa Rica with a day at the beach, a nature boat tour on the Sarapiquí River, a zipline tour in the rainforest, and time to explore the local town. The college mission trip to Costa Rica was a tremendous success. Students not only enjoyed time with each other, but they grew personally in their faith of Jesus Christ. Special thanks to Rev. Johnny Silva of Wesley San Antonio for his vision and leadership that made this Costa Rica mission trip possible, to Wesley San Antonio student leader Jerry Martinez for his planning leadership of the event, for Brenda Meneses of San Antonio Wesley for administrative support, and Rev. Todd Salmi for pastoral leadership during the Costa Rica trip.